Samford University’s internationally renowned A Cappella Choir begins its 2016–17 Choral Vespers season Friday, Sept. 30 at 5:30 p.m. in Hodges Chapel. This will be the choir’s first public performance at Samford since winning the Grand Prix and other awards at the international choir festival Siauliai Cantat during a trip to the Baltics in May. 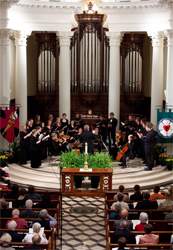 Inspired by the practice of monastic prayer, the Samford Choral Vespers Series is an opportunity to experience exceptional choral music through contemplative worship. Now in its sixth year, this unique service features scripture, prayer, a short meditation and outstanding choral music that ranges from ancient chant to recently composed works. A Cappella Choir is a 36-member ensemble of committed students from a variety of disciplines and directed by Philip Copeland. The first vespers service features the noteworthy “Sanctus and Benedictus” from the Mass for Double Choir by French composer Frank Martin as well as smaller Renaissance works. The Nov. 4 All Saints service features Brahms’ famous “Warum” motet from Opus 74 while the Dec. 4 lessons and carols service will be built around Vivaldi’s well-known Gloria. Each service begins at 5:30 p.m. Admission is free.